What identity means in an algorithmic age: how it works, how our lives are controlled by it, and how we can resist it Algorithms are everywhere, organizing the near limitless data that exists in our world. Derived from our every search, like, click, and purchase, algorithms determine the news we get, the ads we see, the information accessible to us and even who our friends are. These complex configurations not only form knowledge and social relationships in the digital and physical world, but also determine who we are and who we can be, both on and offline. Algorithms create and recreate us, using our data to assign and reassign our gender, race, sexuality, and citizenship status. They can recognize us as celebrities or mark us as terrorists. In this era of ubiquitous surveillance, contemporary data collection entails more than gathering information about us. Entities like Google, Facebook, and the NSA also decide what that information means, constructing our worlds and the identities we inhabit in the process. We have little control over who we algorithmically are. Our identities are made useful not for us--but for someone else. Through a series of entertaining and engaging examples, John Cheney-Lippold draws on the social constructions of identity to advance a new understanding of our algorithmic identities. 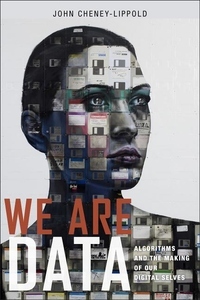 We Are Data will educate and inspire readers who want to wrest back some freedom in our increasingly surveilled and algorithmically-constructed world.